About meI am a recently retired microbiologist (technician) in a research lab. 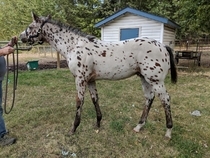 I also raise Appaloosa horses, and, in the past, have had a small web based business of out-of-print and hard to find Appaloosa books. I worked as an out-of-print book searcher in college and still enjoy book scouting, unusual bindings and first editions. No web site at the current time. About my libraryReading and horses! The two constant obsessions of my life. OK--my family (young adult daughter and son), elderly golden retrieiver and a couple cats figure in there somewhere too. I enjoy great mysteries, women's biographies and memoirs along with history, especially local history. And I'm trying to 'beef up' my knowledge of classical and world literature. I love the tag clouds--both my own and looking at others' and considering how they reflect the interests of their owners. I always have at least half a dozen books that I'm reading and my to-be-read mountain requires bottled Oxygen to get to the top. I've decided to add my TBR mountain to my LT catalog to eliminate buying doubles of interesting books and to give a better idea of my current interests. Groups1001 Books to read before you die, 2014 Category Challenge, 2015 Category Challenge, 2016 Category Challenge, 2016 ROOT Challenge - (Read Our Own Tomes), 2017 Category Challenge, 2017 ROOT (READ OUR OWN TOMES), 2019 Category Challenge, 50-Something Library Thingers, 75 Books Challenge for 2008 —show all groups, 75 Books Challenge for 2009, 75 Books Challenge for 2010, 75 Books Challenge for 2012, 75 Books Challenge for 2013, 75 Books Challenge for 2014, 75 Books Challenge for 2015, 75 Books Challenge for 2016, 75 Books Challenge for 2017, 75 Books Challenge for 2018, 75 Books Challenge for 2019, 999 Challenge, A Group Thank You, A Pearl of Wisdom and Enlightenment, All Writers Considered, Atwoodians, Berean Fellowship, Birds, Birding & Books, Book Care and Repair, Book Liberation Project, Booker Prize, BookMooching, Books in Books, Books on Books, Canadian Fiction/Non-Fiction Reading Challenge, Cats and Crime, Christianity, Club Read 2019, Crime, Thriller & Mystery, Early Reviewers, Evolve!, Faith and Reason, Feeling Good by David Burns, food studies, Gardening, Gardens & Books, Girlybooks, Go Review That Book!, Horses, Labyrinths and the Walking Meditation Practice, LibraryThing-ers Anonymous, LTers with dogs, Medicine, Montana Book Lovers, Monthly Author Reads, No, It's Not Just You, Non-Fiction Challenge / Journal, Non-Fiction Readers, One LibraryThing, One Book, Orange January/July, Outdoor Readers, Readers Over Sixty, Readers Without Borders, Reading Globally, Reading Globally II, Reading Resolutions, Reading the World, ROOT - 2013 Read Our Own Tomes, Science Fiction Fans, Science!, Sustainability, Tattered but still lovely, TBR Challenge, The Global Challenge, The Green Dragon, The Teaching Company, Used Books, What Are You Reading Now? One Nation After Trump: A Guide for the Perplexed, the Disillusioned, the Desperate, and the Not-Yet Deported by E. J. Dionne Jr.